While President Donald Trump was very vocal about Islam and speaking out against it, it appears that some of those he chose to fill positions in his administration are brainwashed and have no mind of their own. The latest to demonstrate this is Secretary of State Rex Tillerson, as he romanced known terror organizations and the Hamas-tied Council on American-Islamic Relations, (who indecently have in the past made threats on my life and the life of my family) along with other Muslims Brotherhood front groups at the State Department on Thursday. Jordan Schachtel at Conservative Review said that the meeting with State Department representatives to discuss the ongoing situation in Jerusalem was posted by the American Muslims for Palestine (AMP). “The delegation was brought together by an umbrella conglomerate of Islamist outfits known as the U.S. Council of Muslim Organizations (USCMO). They went to the State Dept. to discuss the “ongoing Al-Aqsa Mosque crisis and Israel's denial of religious freedom in Jerusalem, which is holy to the three Abrahamic faiths,” the AMP website said. In July, Palestinian terrorists stormed outside the Al-Aqsa mosque compound and assassinated two Israeli police officers, setting off a diplomatic firestorm that would result in Israel securing the facility with metal detectors (which would later be removed due to international pressure). Represented at the meeting included a CAIR official and members of other suspected Muslim Brotherhood front groups, such as the Islamic Circle of North America and the Islamic Shura Council of North America. Islamic expert and author of numerous books on the subject, Robert Spencer wrote, "This is the kind of thing that should have ended with the inception of the 'Drain the Swamp' administration. Unfortunately, Trump appointed too many people who did not share his vision, and so that vision is not being implemented, and Obama holdovers are still in charge," he added. 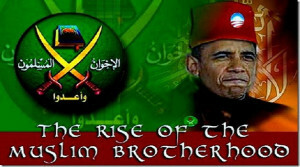 All of these groups are known Muslim Brotherhood front groups who want Islam to dominate the world. "If we are practicing Muslims, we are above the law of the land." Nothing in this has changed! Not one word. THE BOTTOM LINE: When you have a people who have put into print that they seek the utter destruction of an entire state and its people, and on top of that, their fellow brothers in the "hood" (Muslim Brotherhood) are literally Hell bent on taking over the US and the West in the name of the false prophet Muhammed and Allah, then there is a serious issue here. While Trump has backed the idea of doing what the United Arab Emirates did and designating the Muslim Brotherhood a terror organization, Tillerson has done everything he can, just like H. R. McMaster to whitewash Islam and engage in taqiyya on the behalf of Islamists by seeking to to block such efforts. "There are elements of the Muslim Brotherhood that have become parts of governments," he said, pointing out parliaments in Bahrain and Turkey as examples. "Those elements... have done so by renouncing violence and terrorism," he said. "So in designating the Brotherhood in its totality as a terrorist organization… I think you can appreciate the complexities this enters into our relations with [governments in the region]," said Tillerson. Nope, I’m sorry, I can't see the complexities, especially in light of the goals of the Muslim Brotherhood, which are to destroy the West and claim it in the name of Allah/Satan. Tillerson is just demonstrating he is a stooge for Islam, just like others before him. Welcoming these people who hold to these doctrines of demons into our places of government is not only a bad move, but in my opinion is dangerously close, if not over the line, to treason. The Dark or deep State of the Shadow government is still alive and well in Washington D.C. moreover until that criminal Communist under government is exposed and destroyed, America is on a collision course with satanic tyranny. The next one to be fired should be Rex Tillerson.